Q: In the world of motorcycle jackets, what beats a classic cut with vintage styling? A: Not - A - Darn - Thing! Really, it is that simple. Vintage-inspired leather jackets are as cool as it gets. 1,000 years from now when flannel shirts, deep v-necks, and skinny ties are long out of style, people will still see pictures of leather motorcycle jackets and be like “damn, that’s cool.” With the REV’IT! Lane Jacket and REV’IT! Vaughn Jacket, that is precisely the type of jacket riders will be getting. The REV’IT! Lane Jacket is constructed of vegetable tanned buffalo leather that has been crafted to feature a color-washed aesthetic. With a city fit that leaves room to move without being overly roomy, the Lane leather jacket is all about exuding quiet confidence on the bike or the street. That being said, it is first and foremost a motorcycle jacket and provides the features that one would expect from REV’IT!. Along those lines, the detachable thermal body warmer, SEESMART CE-Level 1 protection (shoulders and elbows), and safety stitching all work together to provide the requisite protection necessary for those who make their way on two wheels. To add an even more unique take on the vintage leather look, the REV’IT! Vaughn Jacket brings together two styles into one. Able to be worn in the classic perfecto style with an open lapel collar or snapped to the top with a band collar, the Vaughn allows for variation that is not often found in this type of jacket. The buffalo leather of the Vaughn Jacket has been dyed and waxed during the tumbling process for a specific, long-lasting shine. Additional features of the REV’IT! Vaughn Jacket include SEESOFT CE Level 1 armor at the elbows and shoulders, safety stitching, and a city fit. Basically, it is very similar to the Lane, while offering a different aesthetic. Cool is a state of mind. Gear doesn’t make you so. 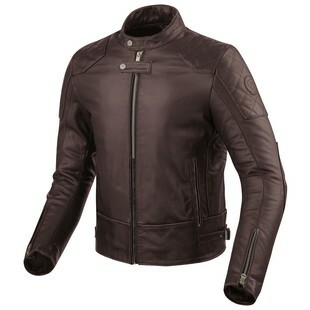 However, once you are there mentally, top-quality and timeless leather jackets from REV’IT! are a good next step.